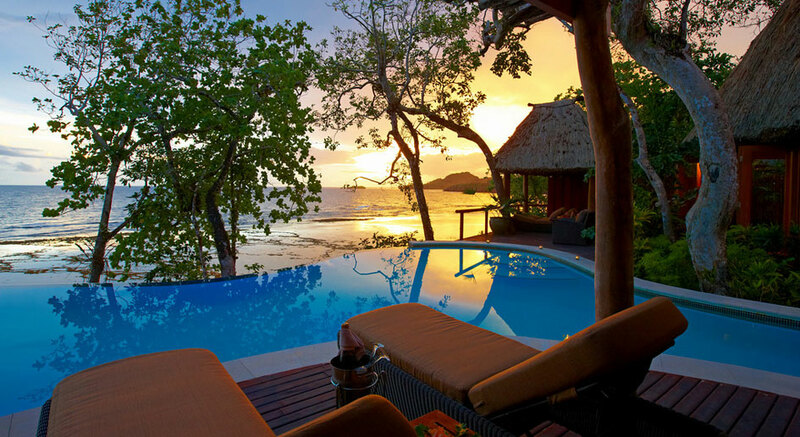 Namale Resort is situated in a former plantation, on Fiji’s second largest island named Vanua Levu. Here you will find a paradise lost in time:. Fiji’s #1 luxury boutique fully all-inclusive resort – Namale is a true getaway for honeymooners: amazing gourmet meals, the largest range of activities available in Fiji, and the most amazing spa in the South Pacific – 10,000 sq ft of pampering that will make you wish you never had to leave. Come discover why Namale is renowned for being the most romantic destination of Fiji and one of the top luxury resorts in the world. Owned by Tony Robbins and as seen on ABC’s The Bachelorette. Namale Resort and Spa offers 19 beautiful Bures and Villas. All are traditional Fijian in style with thatched roofs, Fijian hardwood floors, floor to ceiling screen louvered windows and ceiling fans. Many are equipped with air conditioning as well. King size beds offer the ultimate in comfort, with private decks, fully stocked minibars, coffee and tea making facilities, snacks and CD player. Each Bure and/or villa radiates the traditional Fijian architecture while offering the trappings and convenience of modern and understated luxury. Check out Namale’s amazing video with many more photos of their outstanding award winning Bure. When you think of all-inclusive, Namale is one of the best resorts that comes to mind. Nearly everything at Namale is included in the tariff. All meals and the finest beverages are always available and are totally complimentary. Expect your minibar to be replenished daily, nightly turndown service, and all activities including horseback riding, picnic luncheons under a lovely secluded waterfall, private candle lit dinners on the Namale decks, diving and golf – to name a few. Access to the fitness center, indoor entertainment center and the hydro room in the spa are also complimentary… A spa menu is also available, so please be sure to ask us – it will be send via email to you in a pdf attachment. Namale Resort offers lovely wedding packages that embrace the Fijian traditions. Or for those who are seeking something more secluded a private wedding can also be arranged. It is as simple or elaborate as you like. Special requests are always welcome. The number of weddings is limited in any given week so that each one is very personal and special. Most all activities at Namale Resort and Spa are available at no extra charge. The snorkeling and diving in the area is some of the best in the world. Namale’s dive shop which is on site, offers some of the best expertise in the field. Private deep-sea-fishing charters and hand-line fishing are available; a guide can be arranged if necessary. There are many other activities available such as private waterfall luncheons, horseback riding, a full service (and very grown up) game room compete with bowling alley. Children under the age of 12 years of age are not permitted at the resort, unless the entire resort is booked by a private party. While those over 12 are allowed it is still considered an adult couples only resort.